The information on this page is of a corporate governance nature. If your question is not answered here, do not hesitate to contact the General Secretary in the first instance. We are an incorporated association governed by a Board of Management. Who are the Directors of the MUFC? The Blacks, Blues and the Women's Football are separate entities? No. The Blacks and Blues like to give that impression though. The Melbourne University Womens Football Club became part of the MUFC in 2016. The Melbourne University Football Club is an incorporated association known as “Melbourne University Football Club Inc.” Registered Number A0021824. While you may see media with the terms Melbourne University Blacks Football Club, University Blacks Football Club, University Blues Football Club and Melbourne University Womens Football Club, the legal entity is Melbourne University Football Club Inc. Why? Melbourne University Sport have a policy of one club per sport. The University Reds left in 1997 and are now part of Fitzroy. There is no connection and sentiment has now totally evaporated. Melbourne University Football Club is the third oldest Australian Rules football club in Australia, established in 1859, with only Melbourne and Geelong founded earlier. University played in the VFL between 1908 and 1920, and the club has been a powerhouse in Amateur football since 1921. The women became part of the MUFC in 2016. 3. To participate in, and achieve consistent success in Australian University Sport competitions. Enlist the best available coaches, officials, administrators and support staff and operate from the best possible facilities, so as to encourage, guide and develop players at all levels. •	an environment which maximises the potential of every individual. •	a responsible, varied and vibrant social environment, where lifelong friendships are made and nurtured. Continually develop a club whose very existence, heritage and performance attracts members, supporters and sponsors and encourages past members to want to contribute and participate in limitless ways. We will compete vigorously and be guided by the spirit of the rules both on and off the field. We will be seen to be a proud club representing the University of Melbourne whose style and culture gives its members opportunities not available elsewhere. To be the benchmark for all university sporting clubs in Australia. May I see the Annual Report? Melbourne University Football Club, Inc - 21 729 266 145; Registered for GST. May I see your Liquor Licence? And what's your policy regarding alcohol? May I see your Register of Members? Yes, you may. However we do not publish our members list here in its entirety. Enquiries should be made to the General Secretary. May I buy the a book on your history? Do you have one? Black & Blue. This excellent publication was overseen by co-author John Cordner with sections written by Robin Grow (1859-1900), David Allen (1901-1940), Cordner (1941-1952); June Senyard (1953-1974) and Paul Daffey (1975-2006). It is a must read. For all enquiries about the book, great value at $49.95, please contact the General Secretary. You may be able to secure a keen deal on the price if you are lucky! There must be some forms to fill in? The publishers and producers give no representations and make no warranties, express or implied, with respect to the accuracy, integrity, quality, completeness, currency, reliability, usefulness, or value of any of the material contained in this website or how any information is used. We have been made aware that a former domain name that we retired in 2018 has been populated, by persons unknown, with some offensive material. This matter has been referred to and addressed by Melbourne University Sport and the Legal Services Department of The University of Melbourne. This site was composed and adapted by Peter Selleck, Life Member (1979). It is based on the layout Bober from Themeforest and licensed from Envato. Generally, images are royalty free images from Pixabay. Two teams were selected in 2007 to reflect the best players of the 'Modern Era' - post WWII. One team is of those who played at VFL/AFL level and the other of those who played at VAFA level. VFL/AFL - coached by Frank Dunin (pictured - Richmond). Click here. 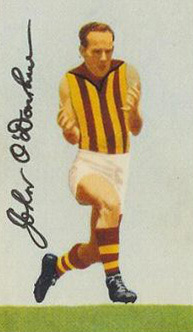 VAFA - coached by John ("Peter") O'Donohue (pictured - Hawthorn). Click here. We propose that the best player ever at the University is Allan LaFontaine. If there is anyone who can match kicking 197 goals in a season? 168 for the Blacks and 29 in representative games in 1933. He played in the centre for Melbourne (1934-42 and 1945), played in three premierships (1939-41) and won four best and fairests. Want to become involved at the MUFC? © 2019 Melbourne University Football Club, Inc. All Rights Reserved.